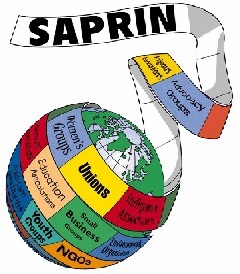 SAPRIN is a global network established to expand and legitimize the role of civil society in economic policymaking and to strengthen the organized challenge to structural adjustment programs by citizens around the globe. The network is working with a broad range of citizens' groups in various countries on four continents to organize public processes to assess the real impact of World Bank and IMF-supported economic reform programs and to chart a new course for the future. SAPRIN and its local affiliates have engaged the World Bank and governments in eight countries -- Bangladesh, Ecuador, El Salvador, Ghana, Hungary, Mali, Uganda and Zimbabwe -- as part of the Structural Adjustment Participatory Review Initiative (SAPRI). In Mexico and the Philippines, as well as in Canada, citizens' groups organized under SAPRIN are collaborating with parliamentarians and other institutions as part of the Citizens' Assessment of Structural Adjustment (CASA). In Argentina and the Central America region, SAPRIN is working with broad citizens' alliances to build alternatives to current economic policies.